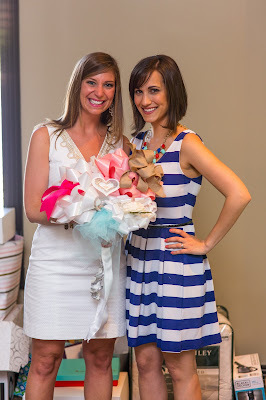 When you are not the guest of honor for a shower (baby or wedding), sometimes it is difficult to decide what to wear. Of course, you do not want to outshine or upstage the lady being honored, so it is important to choose carefully. On the other hand, you want to be dressy and put together-- showers are classy events! These photos (credit: Fairley Foto) are from my own shower in Youngstown in May. My beautiful bridesmaids dressed impeccably for the shower! 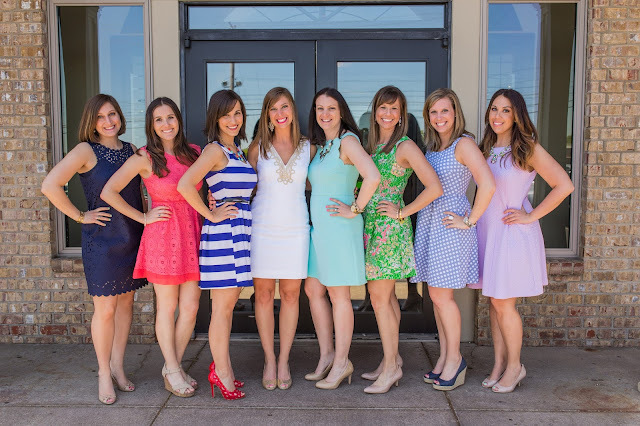 A dress and heels or wedges is an excellent choice for attending a spring shower. The gorgeous Jamie-- the other half of Fairley Foto! Her dress: similar here or here with some bling! I loved every option my bridesmaids chose for the shower. 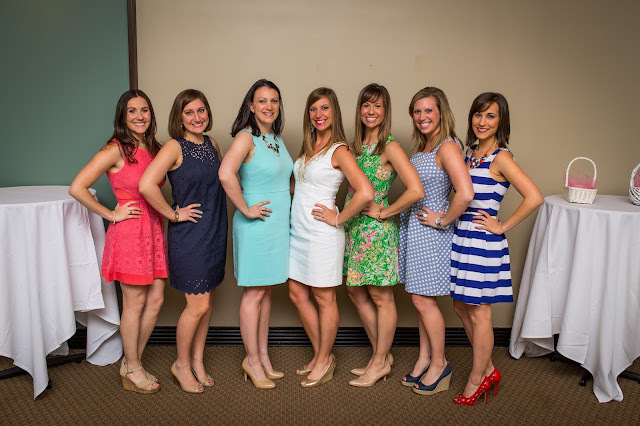 I loved the opportunity to wear my white Lilly Pulitzer shift dress as the bride. One more with my beautiful mom! Courtney's dress (navy): similar here from Boden. Caitlin's dress (pink): similar here by Lovers + Friends. 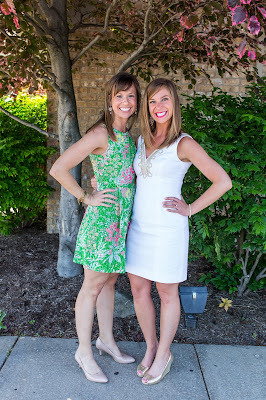 Mandy's Anthropologie dress: similar here in Emerald (check out that back!). I love the idea of a pastel or jewel-toned dress with a statement necklace like my cousin Ashley and sister chose. Dawn (far left) layered with a drapey cardigan (similar here)-- very smart for air conditioned venues in the spring and summertime! Anna's teal dress (old Loft): similar here lace version! And here in green and purple. Ashley's dress, lavender: similar here by DVF. Statement necklace options: here and here. This photo is from my sister's shower. Anna is in Lilly P. and I am in a Banana Republic dress. Anna (old Lilly): similar in pink here. Me (old Banana): I adore this alternative. My sister's beautiful bridesmaids opted for silk/textured/patterned dresses. I love what they chose! Polka dots here or here like Jackie's; silk and ruffles here like Meg's; mint like Ashley's here; and belted red like Julie's here--are great starting points. For Anna's shower in Chicago, I planned a Breakfast at Tiffany's themed event. Of course, if there is a theme, dress to match it! We wore our LBDs and pearls! Little Black Dresses: sleeved and strapless options. With my mom, Anna and myself. 3/4 sleeved dress on my mom: love the ruffle bottom here. J.Crew Factory multi-strand necklace: always a standout. 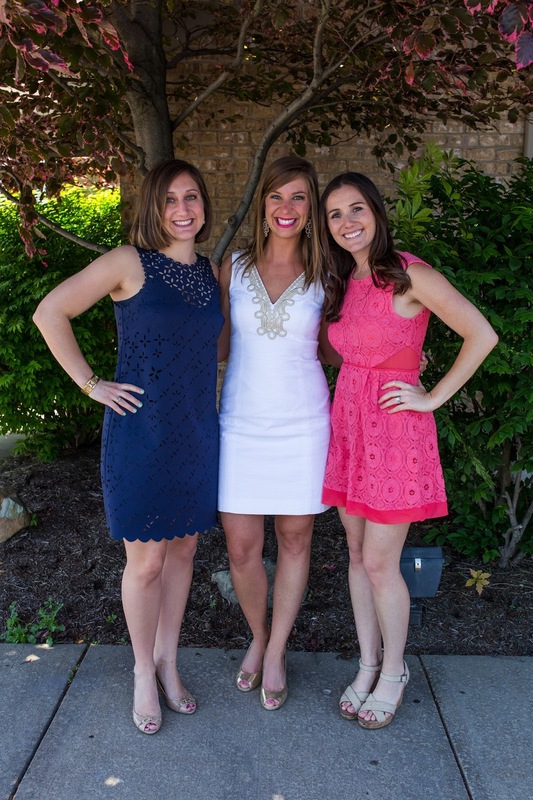 For Ashley's (middle) shower in late July, Courtney and I chose lightweight dresses for the occasion. Courtney's (old J. Crew): similar here. Mine (old Lilly Pulitzer): similar here. The beauty of Court's and my dresses is that you could add a cardigan and tights with either dress to transition it for winter showers. 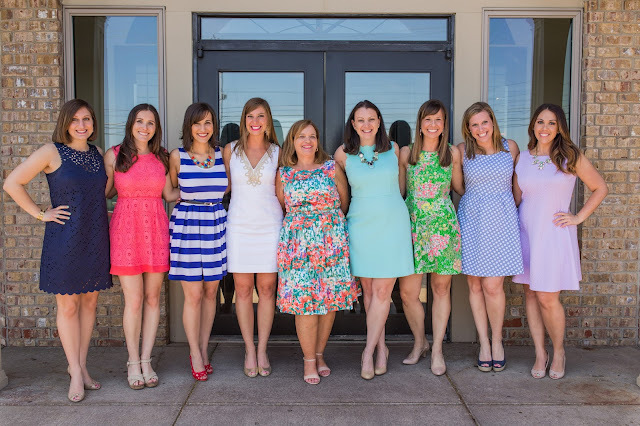 Fran's lovely wedding shower was also in the summertime, so I went with another Lilly shift dress. 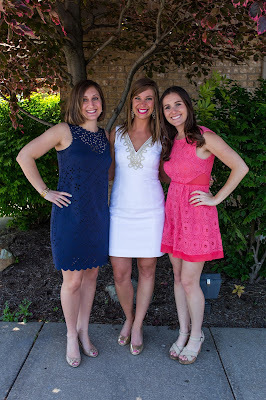 My Lilly dress (far right) is old, but here is a similar option. Okay, and I can't talk wedding showers without talking about the time Taylor Swift came to my family friend, Gena's, wedding shower! OMG!!! Amazing. Ashley's navy lace dress: similar here (in navy). Taylor's mint eyelet dress: similar here. Seriously, though, how cute is my girl Gena? And Taylor! One more with Dawn!!! Taylor! Julie's wedding shower was in the summer months, as well. I went for another Lilly option. It, too, is a few seasons old, but here's a nice alternative. 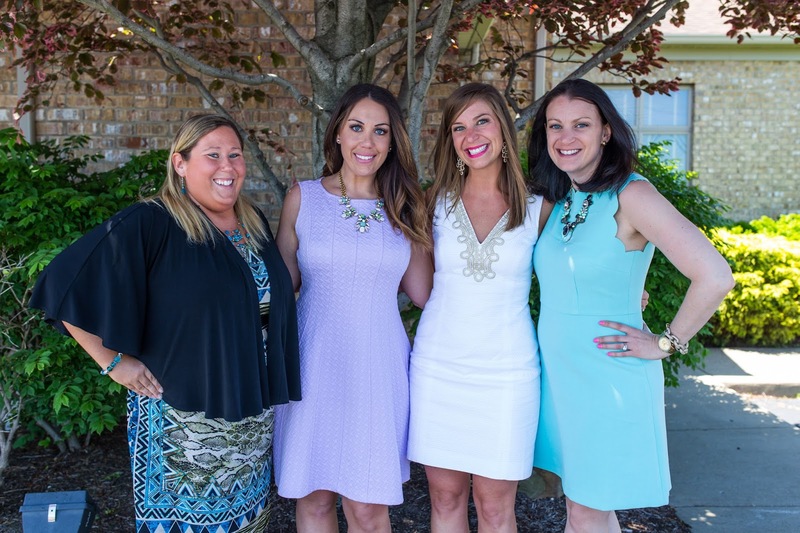 Me, Libby, Jackie and Kate all went Lilly Pulitzer for Julie's wedding shower. I love how Kate adds a cardigan to her strapless dress. Libby's dress (navy and pink): similar here. Jackie's maxi dress (white and navy stripes): similar here. Kate's dress and cardigan: similar here and here. On the other hand, I went to my sweet cousin Jackie's baby shower in the coldest months of Illinois winter. I opted for a geometrical striped sweater and statement necklace to combat the negative wind chills! (My Goddaughter in my arms as a little one!). More sweater options: here and here (loving the length on this!). More statement necklaces: here and here. I am heading to my dear friend Lauren's wedding shower on Saturday this weekend, so I will update you all on what I choose for a winter wedding shower! (Also, shout out to Lauren for the idea for this post! I LOVE suggestions from friends for blogging! Keep 'em coming!). Just ordered this for my sister's baby shower in a couple weekends! I hope it fits! What's your go-to look for a wedding or baby shower? Thank you so much for sharing these tips for attending wedding showers. I liked these looks. My cousin is getting married at wedding venues NYC and will be host bridal shower for her. Thinking to go with one of these party looks for the event. Thank you so much for reading! I really appreciate it! :):) Enjoy your shower!